Don’t you love a good BLT sandwich? 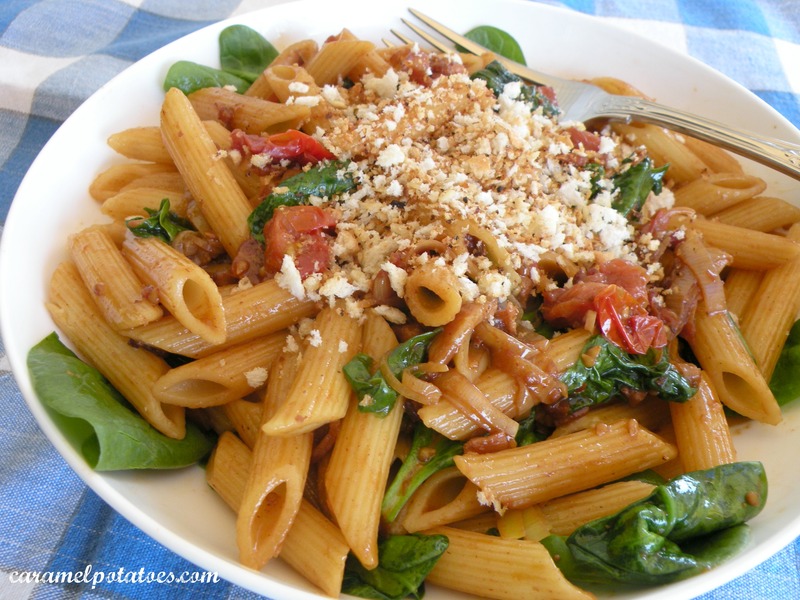 Here is a take on that classic taste in a light pasta meal. Add some bacon, caramelized tomatoes, leeks and wilted spinach to your pasta, top it off with some garlic bread crumbs – all those great BLT flavors with pasta – yum! A perfect light summer meal. Bring a pot of salted water to boil for the pasta. Mince garlic for the bread crumbs in a food processor. Add cubed bread and process until coarse. Heat oil in a nonstick skillet over medium; add crumbs and toast until gold, about 3-4 minutes, stirring often; set aside. Cook bacon in a large nonstick skillet over medium heat until crisp. Remove to a paper towel-lined plate. Pour off all but 1 Tbsp drippings. Caramelize tomatoes and sugar in drippings over medium heat. Cook until tomatoes begin to brown, about 5 minutes. Add leeks; saute until wilted, 3-4 minutes. Add chicken broth to skillet to deglaze (scrap off drippings); Add broth, balsamic vinegar, and pepper flakes. Simmer until liquid is reduced by a third, about 5 minutes. Cook Pasta in boiling water according to package directions. Add the spinach, thyme, and cooked bacon to the tomato mixture. Transfer cooked and drained pasta to the skillet. Toss to coat; season with salt and pepper. Divide pasta onto serving dishes and sprinkle with bread crumbs.